Upper Egypt is known for its breathtaking natural sights, historical monuments, and rich culture. 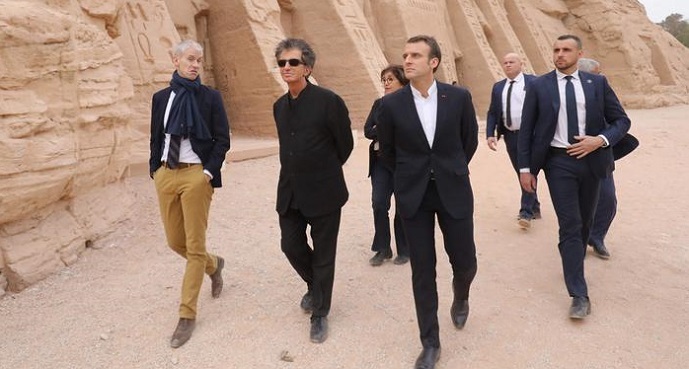 Speaking of all these things, it only made sense that Macron’s first stop in Egypt had to be Upper Egypt, specifically the iconic Abu Simbel Temple. Antiquities Minister Khaled El-Anani, Tourism Minister Rania El-Mashat, and Aswan Governor Ahmed Ibrahim all received the French president and first lady, Bridgette Macron, at Aswan International Airport. Macron is currently in Cairo. Yes, Cairenes, this explains all the crazy traffic jams that you’ve been experiencing, especially in the Downtown area near Tahrir Square. Aside from exploring our beloved capital, Macron is going to be meeting with influential business, religious, and cultural leaders and figures. Macron’s visit also coincides with the start of ‘France-Egypt 2019’, which was launched earlier this year to commemorate the 150th anniversary of the opening of the Suez Canal.